Saturday, after Satoshi's German class, we checked out Budo-tei. 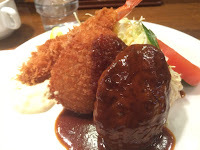 They are located next door to Udon Bo. But in comparison to Udon Bo, the line for Budo-tei is always long. The line in front of the shop is just the tip of the iceberg. Be sure to look across the shop, the people standing there are the rest of the line waiting to get in...eep! 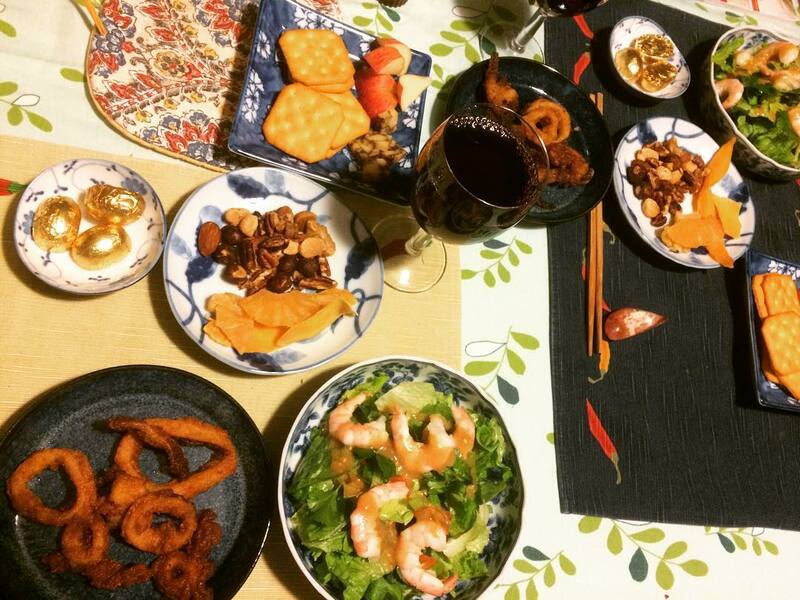 Click on the photo to see Satoshi's sizzling lunch...ebi fry (fried shrimp) and hamburger. I got the A set...hamburger, croquette and ebi fry. I loved the hamburger, so moist! And the cole slaw had a little grated apple in the dressing, delicious. Friday, it was forecast for some snow. Saturday when we awoke...at least a couple of inches had fallen. At least it wasn't a lot, where we needed to shovel (not that we have a snow shovel). 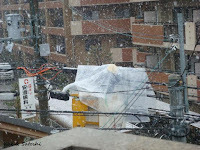 It also made for walking to the train station interesting, at least it wasn't slippery and the snow melted by the time we came back. 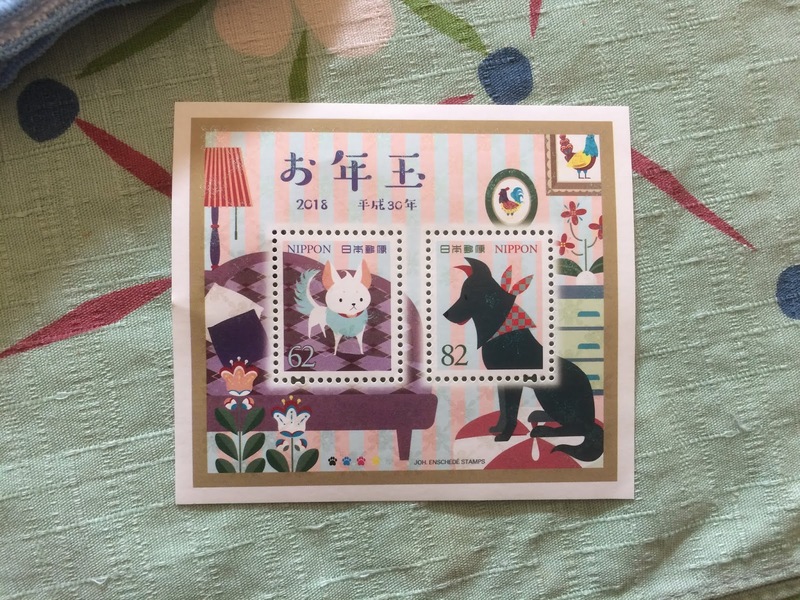 I recently went to pick up the stamps that we "won". 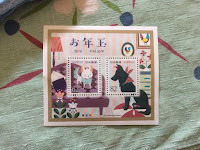 Every year, at the bottom of our nengajo (new years cards), there are numbers. 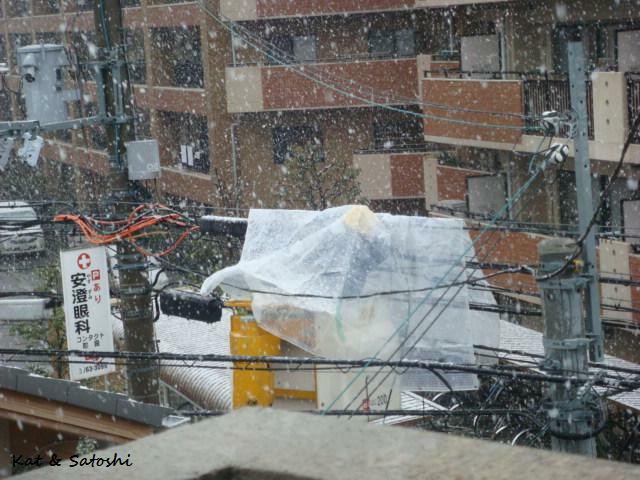 On January 15th (or there about), they pick random numbers for various prizes. You have the best chance of winning these stamps because you only need to look at the last 2 numbers on your card. 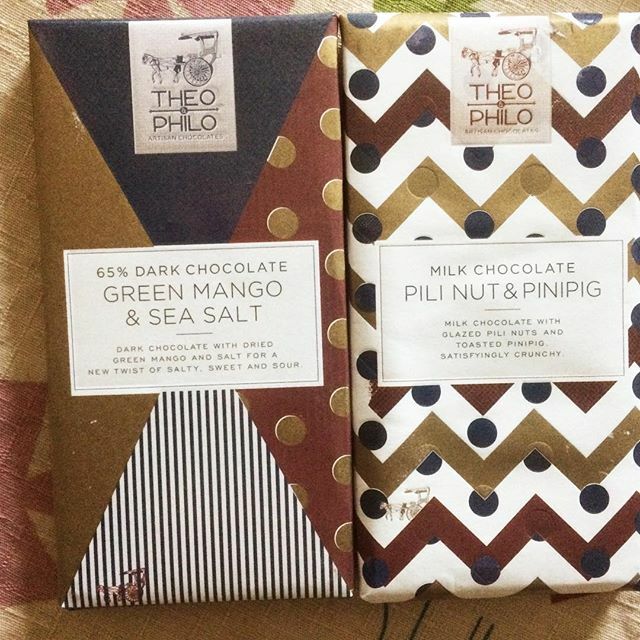 I recently stumbled upon these interesting sounding chocolates by Theo & Philo. 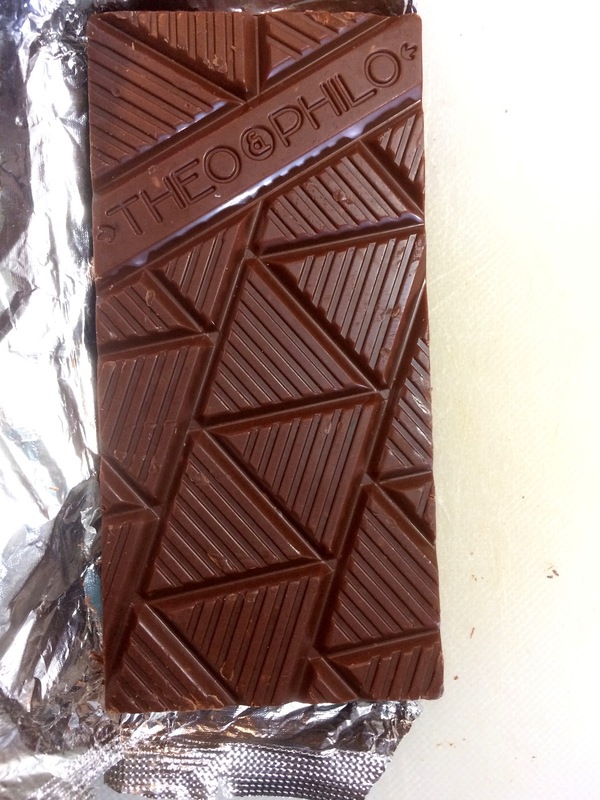 They are a bean to bar maker in the Philippines and their cacao is also from Philippines. 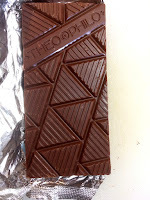 The green mango and sea salt was a 65% dark chocolate bar. The mango was a bit undetectable so I was a bit disappointed. The pili nut and pinipig was a milk chocolate bar. I had to look up what pili nut and pinipig were. Pili nut is a type of nut grown in the area and pinipig is a rice. This was similar to a puffed rice with nut bar. The chocolates were creamy and delicious. I'm glad I got to try these and hope to find more chocolates coming in to Japan during this time of year. 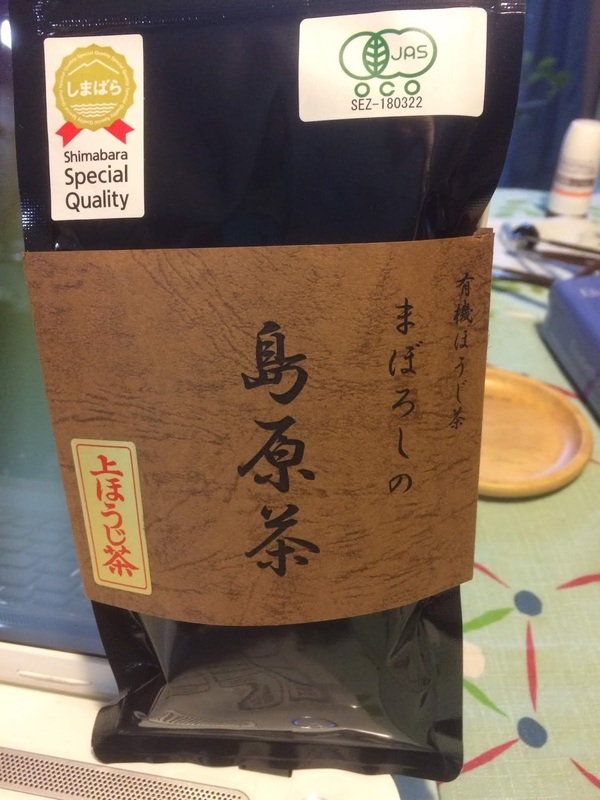 Last year we tried Shimabara tea and enjoyed them. Since I needed to pick up some hojicha (roasted green tea) for a recipe I wanted to try, I was pleased to see them in Umeda the other day. This morning we had hojicha okayu. Now that I think about it, it is similar to chagayu or chagai as my grandma used to call it, though I think my grandma used to use mugicha (barley tea). 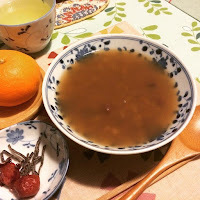 Hojicha okayu : adapted from "Soup Stock Tokyo 2"
Put 5 grams of hojicha in 1 cup of water, leave in refrig overnight. Put 1 dashi "tea bag" in 4 cups of water (or the amount of water your bag instructs), leave in refrig overnight. 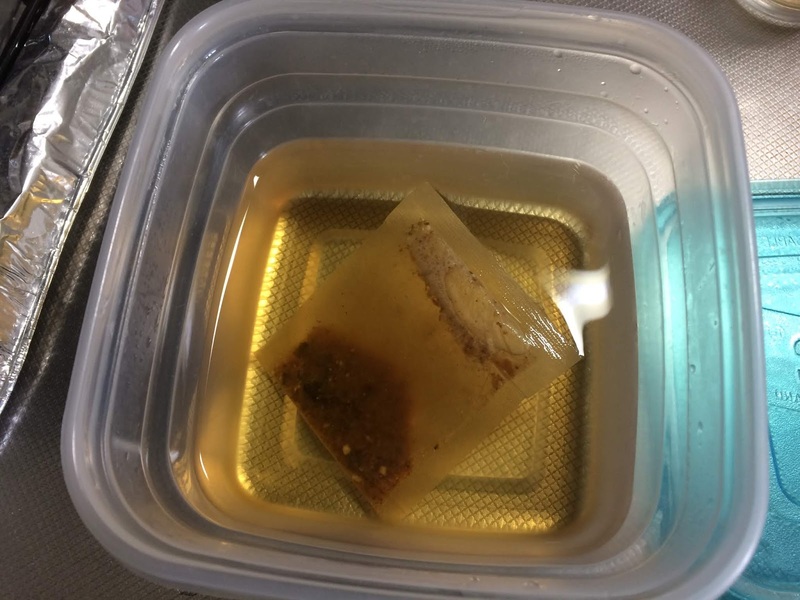 In the rice cooker pot, put 1/4 cup washed rice and 1 cup of cold brew hojicha and 2 cups of cold brew dashi. Cook on the "okayu" (porridge) setting on your rice cooker. NOTES: Since I didn't want to make 4 cups of hojicha dashi, I kept the hojicha separate. When putting everything in the rice cooker, the cold brew hojicha was a little less than 1 cup, so I filled the difference with some water. The hojicha flavor was quite pronounced. I still need to try the actual recipe from the book I have, but at least I know now that it is relatively easy to put together. I served this with some umeboshi and shiofuki konbu. Oh and we've got cold temps back again after a brief "warm" spell last week. Saturday night we went to check out the Loaf's dinner menu. There were some customers but not totally busy. 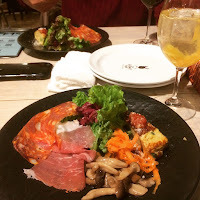 Dinner started off with their antipasto which comes with some salad. I liked the carrot salad with a hint of orange in it. And the frittata was served warm. My main dish was grilled chicken with BBQ sauce. 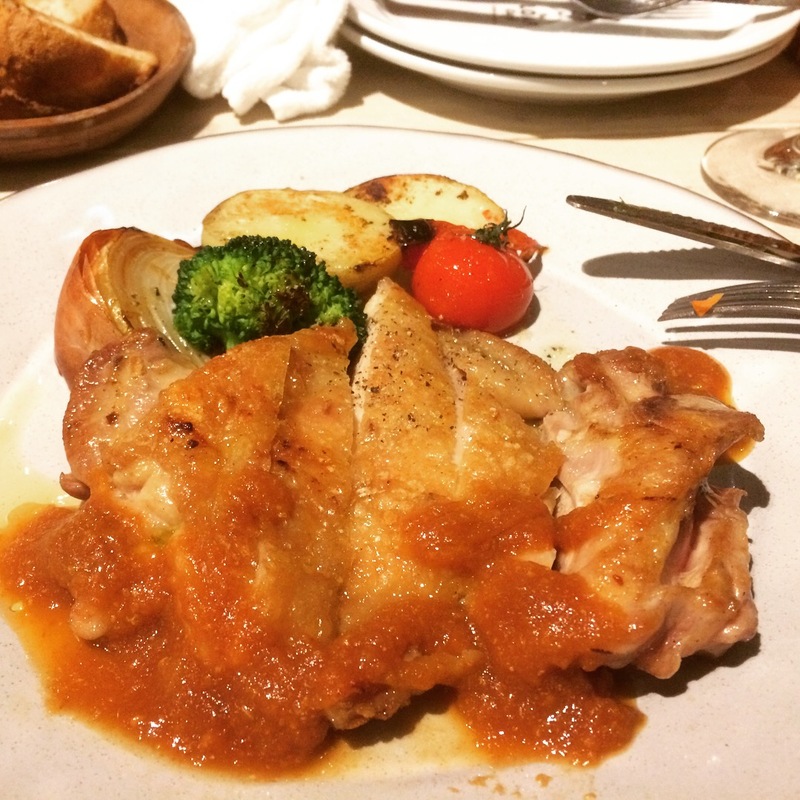 I really liked how tender the chicken was and the roasted veggies served along side was good. Satoshi had their steak which he said was very tender. 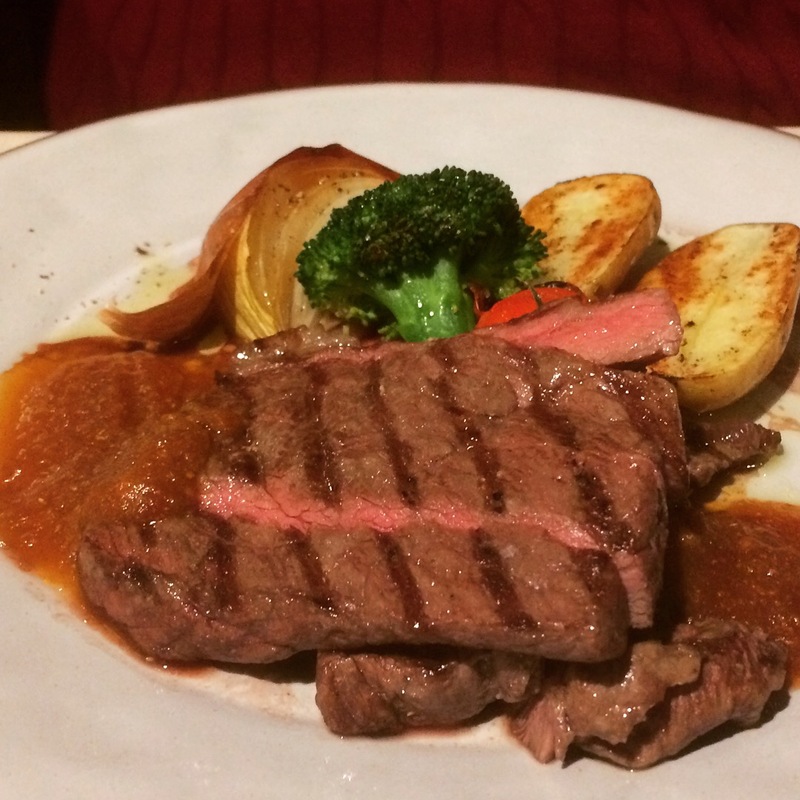 Despite the wait for our main dishes it was a nice meal. I think the next time we come for dinner, we'll order different pupus...we'll be back. 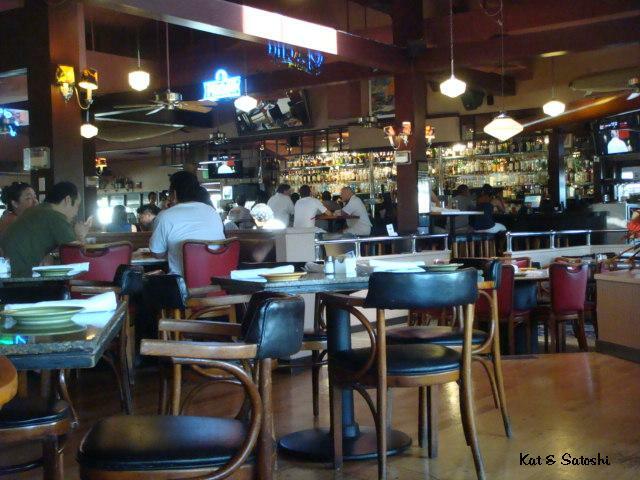 Ryan's Grill will be closing its doors this weekend. Late last year, we were sad to learn of it. If you've been reading our blog, you'll know this was where Satoshi and I went on our first date. 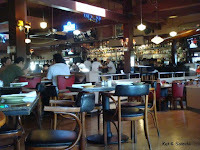 It was a great place to get together for drinks, pupus (appetizers), birthdays and other events. Satoshi said he favorite food there was the blackened seared ahi (yellow fin tuna) while I really enjoyed the frozen li hing margaritas. Thanks for the good memories we are sad to see you go. Over the weekend, you may have heard there was a false alarm in Hawaii, sending panic across the State. BFF, Wen said she didn't even get the alert on her phone...yikes! Thank goodness it wasn't real but I'm sure it was still quite chaotic and scary. I am not too sure what we are supposed to do here in the event that we get the "notice", but hope the government here will give us more details on what to do. 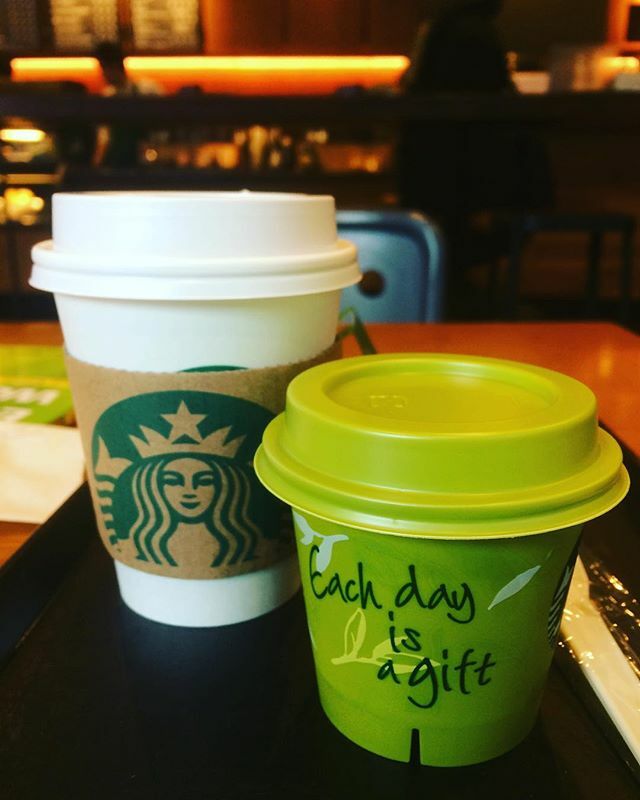 Yesterday though, I received this "message" at Starbucks on the back of my matcha pudding..."each day is a gift". 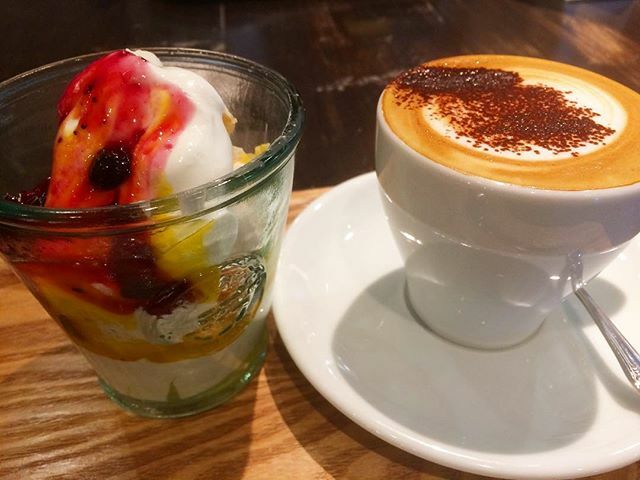 Friday, I met up with Tamakikat and after lunch we stopped into Komin Cafe for some sweets and coffee. This cafe is Oceania themed so a lot of their food items come from Australia and New Zealand. It was my first time trying pavlova. Apparently pavlova is a "marshmallow"-ish meringue topped with cream and fresh fruits. This version was served in a cup with the meringue, yogurt mixed with fresh cream and fruit purées (passion fruit, blueberry and raspberry). Not overly sweet and perfect with a cappuccino. Tamakikat had a custard square (square shaped custard pie) and a flat white (creamier than a latte). I'm glad we tried this place. It is rather quiet and you can just hang out there. Thanks for meeting up, Tamakikat! Last year, I washed Satoshi's knit cap and put it onto a bowl (which was smaller than the one in this post, but smaller, and didn't realize it shrank. I put the pen there for reference. 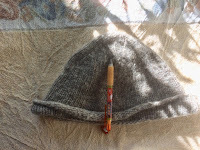 I looked online and there was a method to unshrink it. Put it into lukewarm water for 10 minutes. 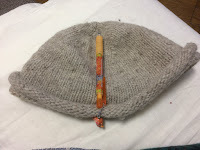 Squeeze out the water and dry on a towel,pulling it gently into shape while it is drying. Which made it bigger than before. 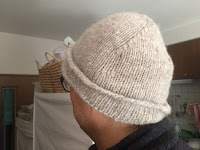 At least now he can wear the hat...whew! We've been having fahreezing temps. Most days have been overcast too. I've been craving foods with color. 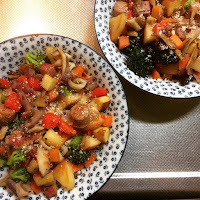 I re-vamped that winter rainbow gratin and added some sausage and the apple that I omitted the first time around. I also didn't bake it (because I was starving when I made dinner). Anyway, after taking this picture and eating my bowlful, Satoshi emailed to say he had a last minute drinking thingy, so he wouldn't need dinner...boo! We had his portion this morning with a sunny side up on top and crusty baguette. 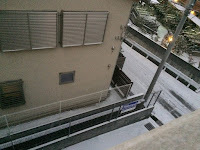 The rooftops were whitish though the frost soon melted. I think the weather dude said our temps are gonna be 5C (41F) max today...brr. 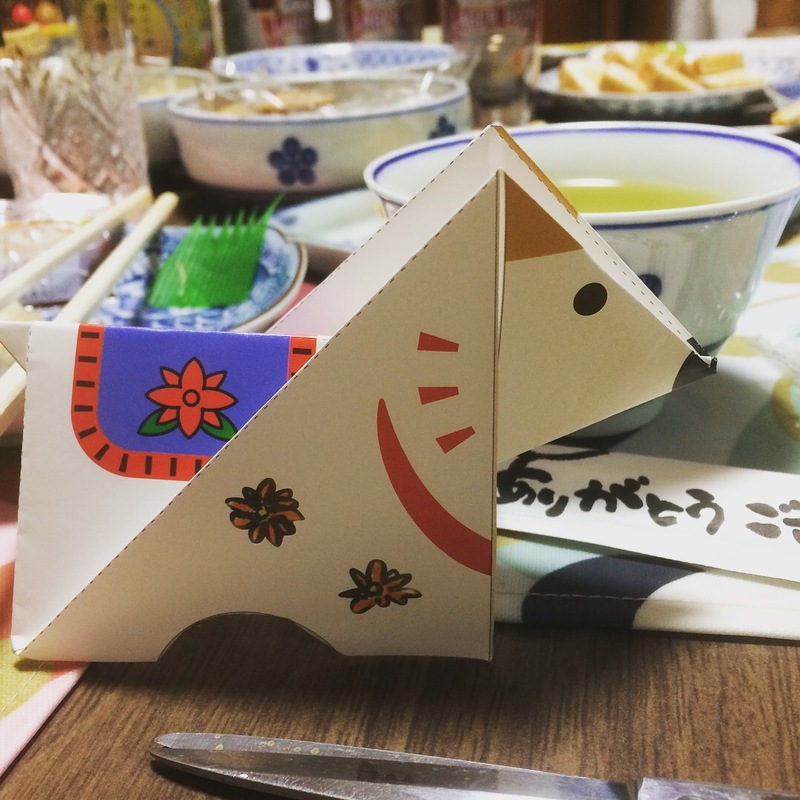 The other day we had our nanakusagayu for breakfast. I've written about this before, here. In the past, I would buy pouches of the ready made okayu, heat it up and then add the 7 grasses. These days I make okayu in my rice cooker. 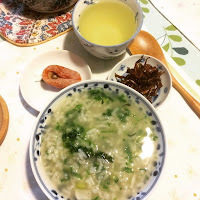 The other day, though, I added dashi (stock) to cook my okayu (rice porridge). Cook in rice cooker on "okayu" mode. 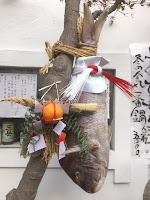 NOTES: Satoshi and I agree okayu is much more flavorful cooked with dashi. I think I may cook okayu this way from now on. I like this consistency but if you don't like your okayu too watery, you can play around with the amount of water/dashi you use. 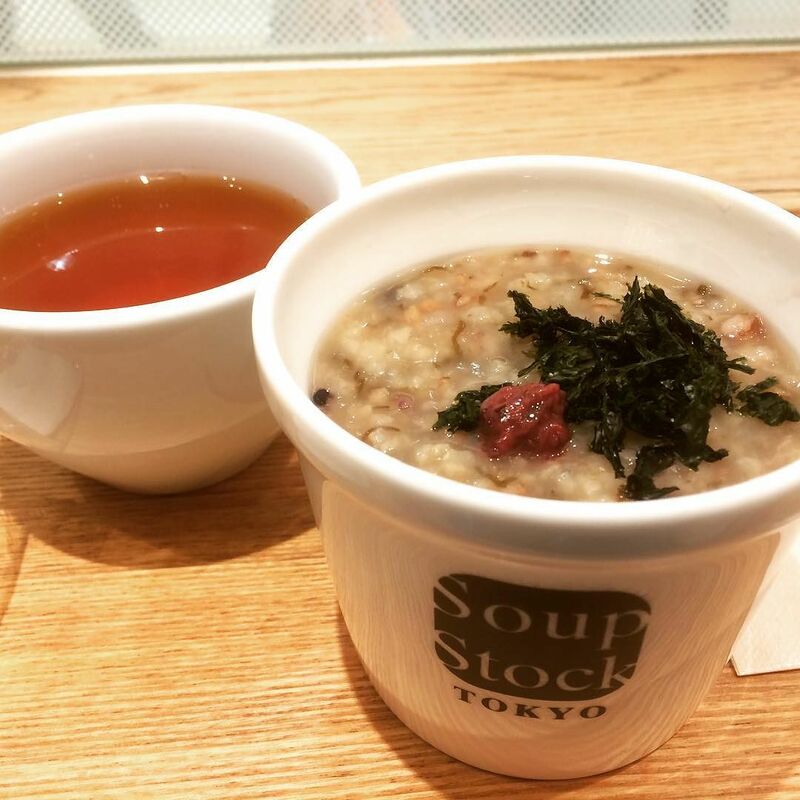 Saturday, I had breakfast at Soup Stock Tokyo and tried their hojicha okayu (roasted green tea rice porridge). The tea flavor wasn't very detectable, but I enjoyed this. I have their cookbooks and was happy to find that they have the recipe for this particular okayu. Will try it as soon as I can get some of the ingredients together. If you've ever eaten o-sechi or foods during the New Year season in Japan, you may have noticed these fancy chopsticks called Iwaibashi (literally celebratory chopsticks). 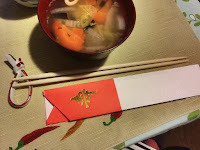 The chopsticks are pointed on both ends and wrapped with decorative red and white paper. Apparently the chopsticsks are bleached white. 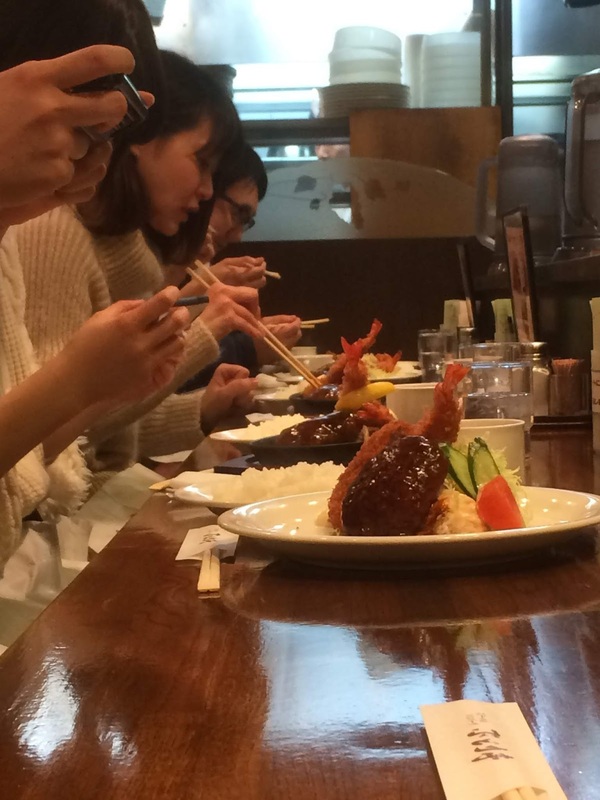 The reason these chopsticks are pointed on both ends is that it is thought you are sharing your meal with the Gods. 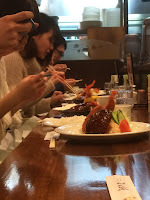 I know some people like to flip their chopsticks to the opposite side to take food, but when using these, you aren't allowed to--It is thought to be rude because you are using the Gods' side of the chopsticks. So try to remember to only use the side you ate with. 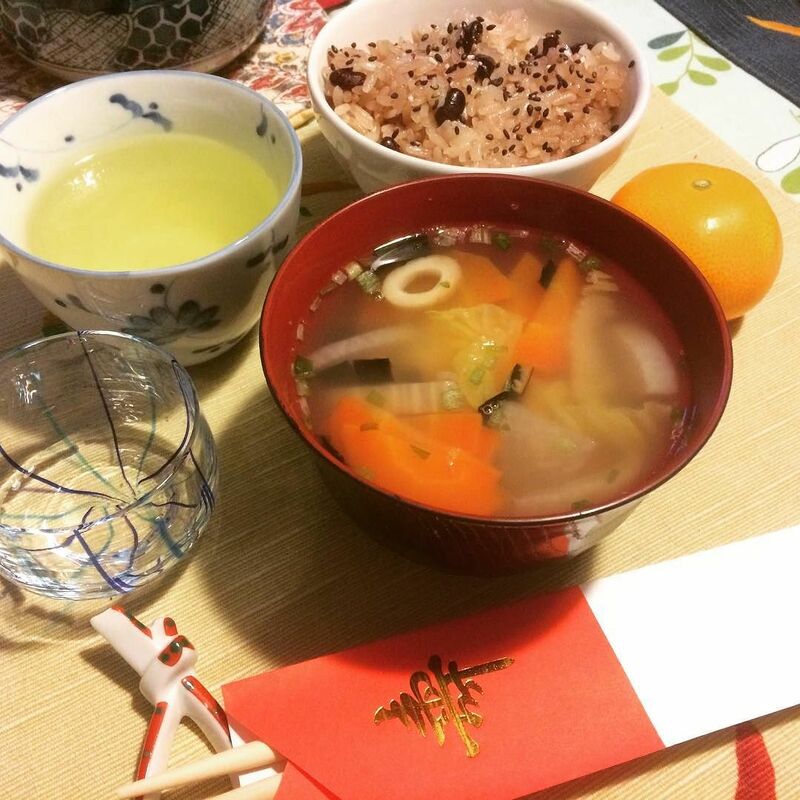 Also these chopsticks are already separated because the Japanese feel that it is bad luck to "break/split" the chopsticks during an auspicious time. We use these chopsticks from January 1st (washing them between meals) until January 7th. 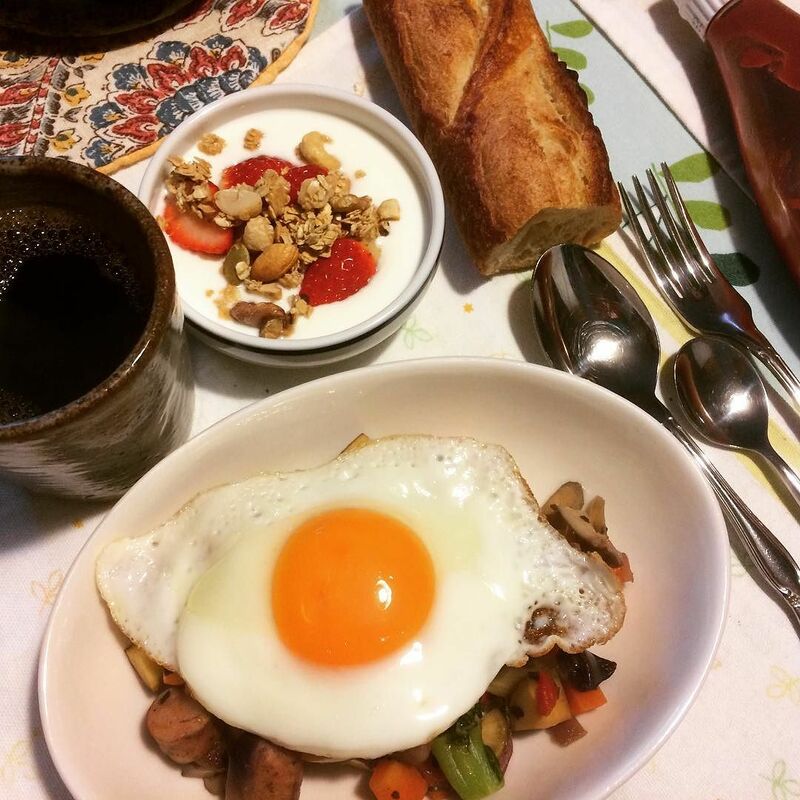 We tried Ichidagaki this morning. 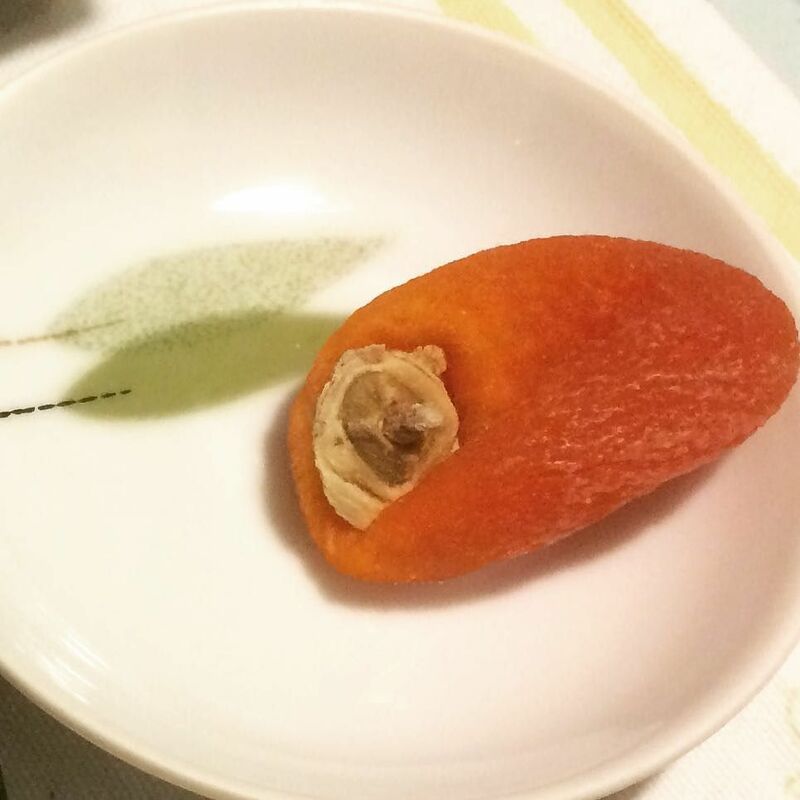 These persimmon are grown and dried in Shinshu, Nagano. They are a lot smaller than the anpogaki that we've tried before. And while the anpogaki are semi-dried and more gelatinous, the texture of the ichidagaki remind me of dried apricots. I'm glad we got to try these and I'll be on the lookout for these next season. Enjoy your weekend and if you are in the areas affected by that krazy snow cyclone thingy in the Eastern part of the US, please stay safe! Satoshi went back to work today, so I have some time to post. 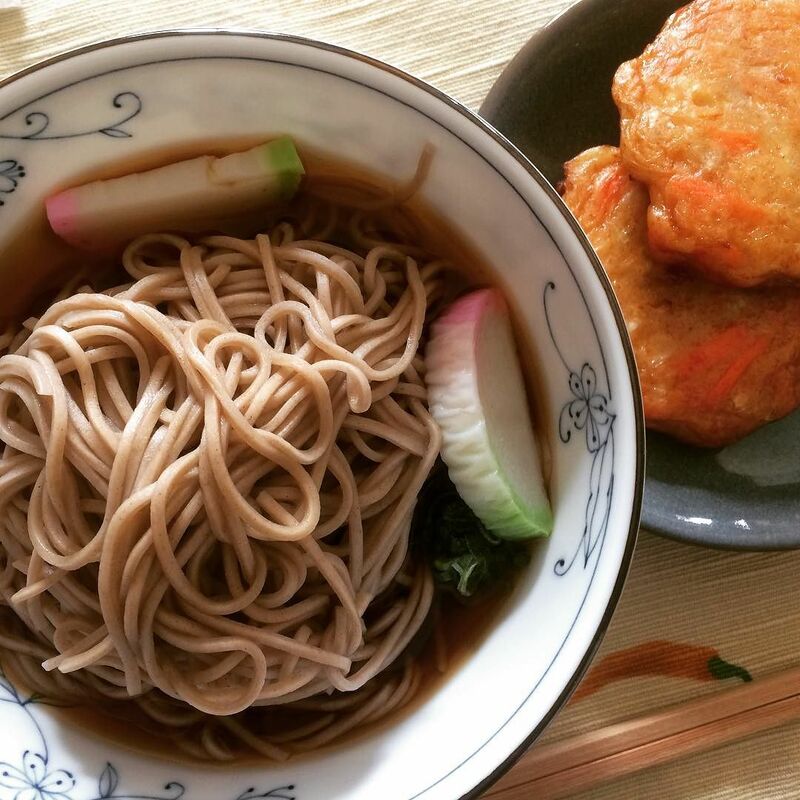 On New Years Eve day, we had toshikoshi soba for lunch. Then for New Years Eve dinner we had all sorts of nibbles. 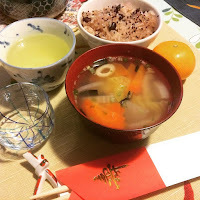 New Years Day morning.. we had ozoni with mochi in it, some sekihan (reddish rice with azuki beans), and o-toso (which is just a little sip of sake to ward off illnesses and to start the new year). 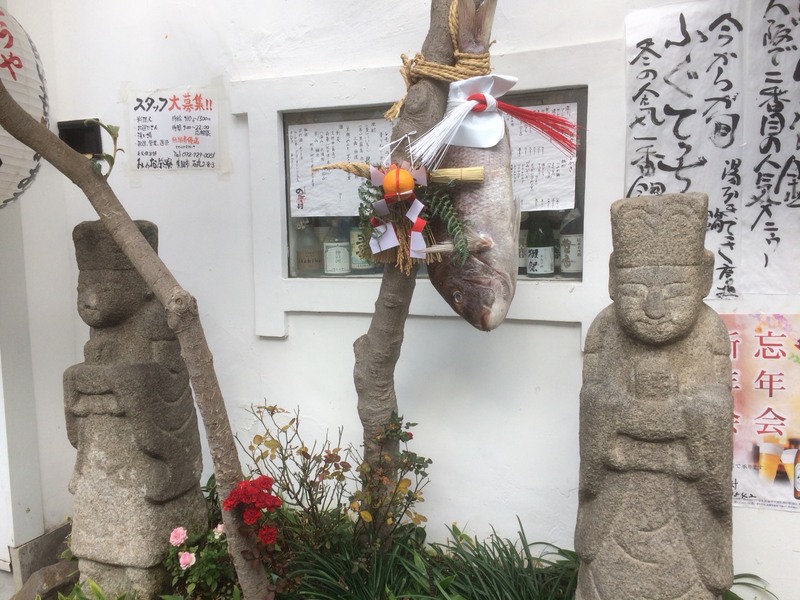 We went to several of the shrines that we normally do for Hatsumode (first prayers of the New Year). While standing in line to get to the prayer area of a shrine, we saw this huge tai (sea bream), just hanging in front of an izakaya (Japanese pub). 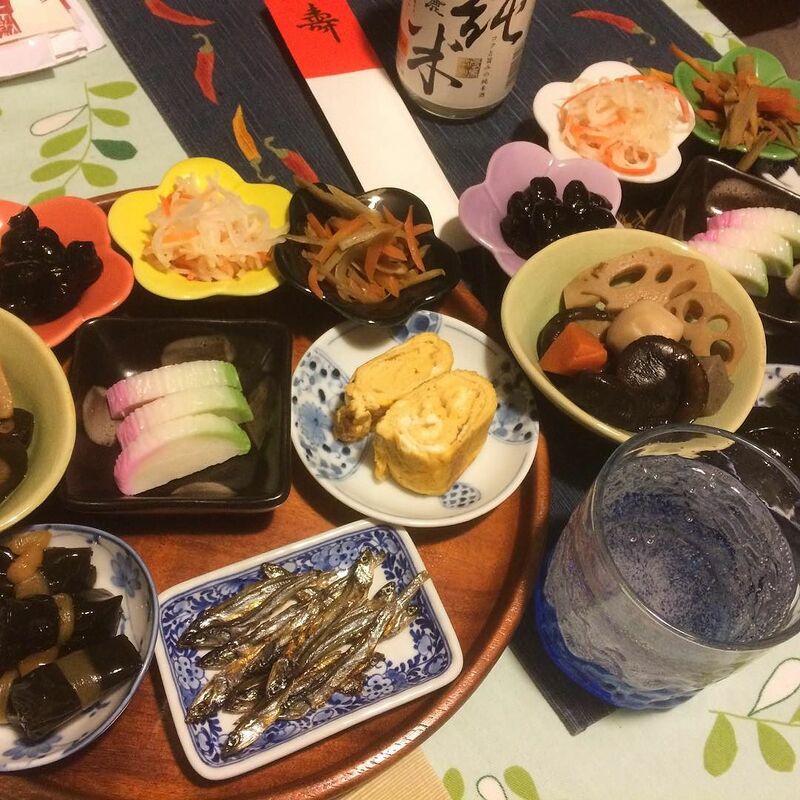 Dinner was o-sechi, the foods that are normally eaten during this holiday...I've written about this previously,here. I'm super thankful for pre-made stuff and not having to do these foods from scratch. On the 2nd, we braved the crowds of the department store to pick up some bento. Luckily, we knew what we wanted to get, so we were in and out of there rather quickly...it was super nuts! 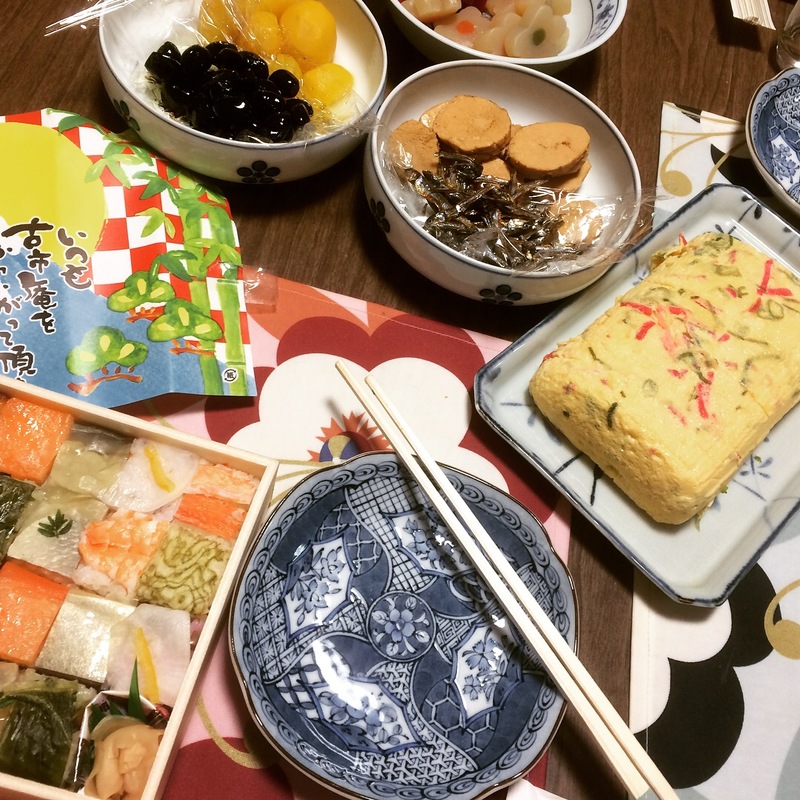 We brought the bento and went to visit MIL. 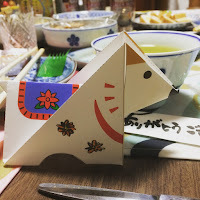 I noticed this origami dog on MIL's calendar, so we cut it out and folded it into the dog. 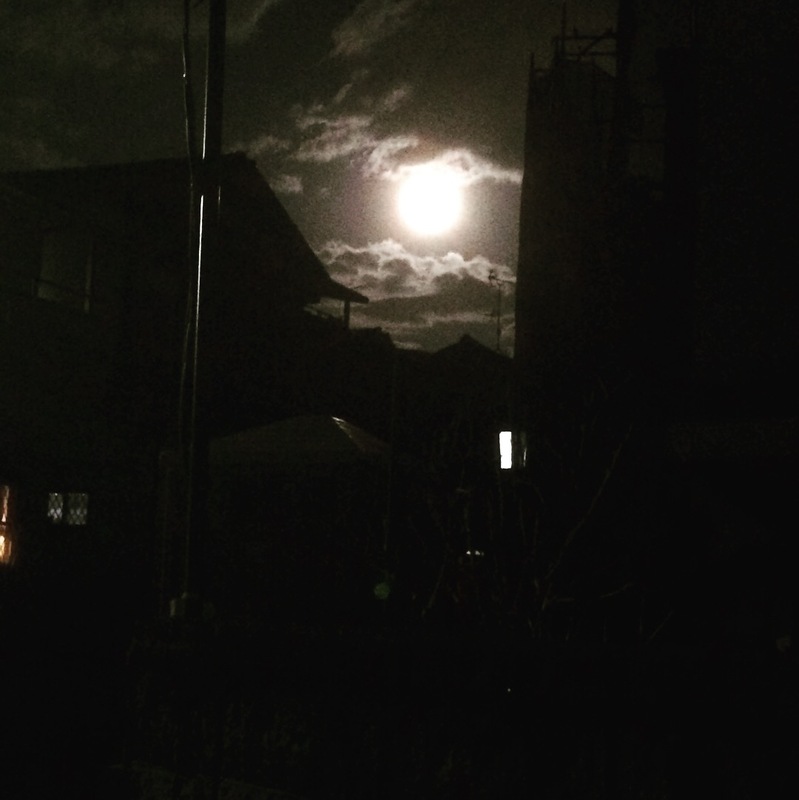 We saw the Super Moon as we walked home from the train station. 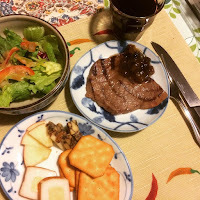 And then last night, we were craving some meat, so we had some steak with mango chutney and other nibbles. Hopefully you all had a great holiday season.